Blue lupin (Lupinus angustifolius L.) is one of the 200 species of lupins, a genus of multipurpose annual legumes grown throughout the world both for their seeds used in feed and food, and for forage. Lupin seeds can be an alternative to soybean in all livestock species due to their high content in good quality protein (in the 30-40% range). Lupins also contribute to the sustainability of cropping systems (Lucas et al., 2015). The other main cultivated lupin species are the white lupin (Lupinus albus), the yellow lupin (Lupinus luteus) and the pearl lupin (Lupinus mutabilis) (Jansen, 2006). Lupin (Lupinus spp.) is the most important legume crop grown in Australia, and blue lupins represent 91% of total lupin cultivation area (Pulse Australia, 2016). In Australia, the bitter varieties that form blue flowers and have high alkaloid content are called "blue lupin" and are used as green manure. 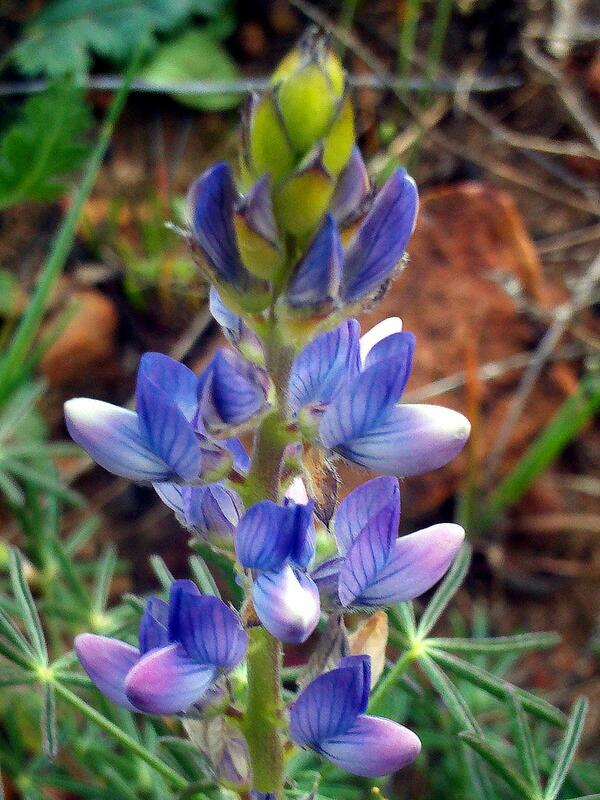 The sweet varieties of Lupinus angustifolius with low alkaloid content are known as "narrow-leaf lupin". Their seeds are harvested and fed raw or ensiled to livestock. Their stubbles are used as forage or as pasture (during late winter or early spring) for livestock. The majority of blue lupin production is used by animal feed manufacturers, ruminants (cattle and sheep) being the largest market, followed by pigs and poultry. There is small but increasing use of lupins in aquaculture. About 40% of lupin production in western Australia is retained on-farm as feed and seed, or is traded on the domestic market to supply the sheep, dairy, pigs and poultry industries (Wilkinson, 2017). Lupinus angustifolius is a self-regenerating annual legume that reaches a height of (20-) 60-150 cm (Ecocrop, 2017). Blue lupin is deeply taprooted, the roots reaching a depth of 2.5 m. The stems are robust and hairy, with profuse lateral branching, when sown at low density. The foliage is dark-green in colour. The leaves are digitate and the leaflets are narrower (hence the name "narrow-leaf lupin") than in white lupin (Lupinus albus) (Wolko et al., 2010; Wiley, 2009). The inflorescence is a terminal, 3-30 cm long, false raceme bearing many blue pea-like flowers. The pods are large and shatter readily once mature, making them difficult to direct harvest. Pods are susceptible to bud worm (Heliothis) damage when green. The seeds are hardcoated, and they can remain viable in the soil for up to 20 years. This means that it is almost impossible to eradicate blue lupins from a paddock. Seed weight is about 230 mg (Wiley, 2009). The flowers are usually blue in colour but some new varieties have white flowers (Ecocrop, 2017). Blue lupin seeds from "sweet" cultivars are used as a protein source in animal feeding. Blue lupin stubbles are used for forage and silage, and for late winter and early spring grazing. Bitter cultivars are grown mainly for soil improvement. Blue lupin is a good source of honey (Ecocrop, 2017). In France, it was formerly used as a coffee replacer (Koltz, 1864). Yellow and blue lupins prefer light to medium textured, well-drained soils that are acid or neutral. 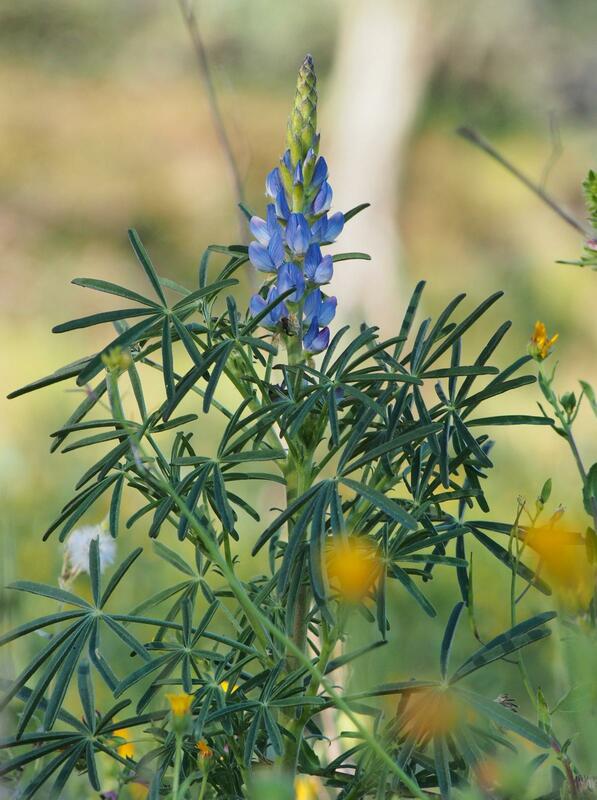 Blue lupin does well on low to moderately fertile, well-drained, light or medium textured, and mildly acidic to neutral sands and sandy loams. It does not withstand waterlogged soils but has tolerance of transient waterlogging (Wolko et al., 2010). Under conditions where P is limiting lupins form specialized cluster root structures and/or release P-mobilizing carboxylates that free it from insoluble forms (Lambers et al., 2012). However, blue lupin is less effective than white and yellow lupins for P and Zn uptake (Wolko et al., 2010). Statistics about lupin production are nesting all types of lupins. Worldwide lupin production in 2014 was about 1 million t. The main lupin producer (625,000 t) is Australia which is known to produce blue lupin. Other important producers are Poland, Russia, Germany, Belarus and Ukraine, totalizing 290,000 t of which most lupins are yellow lupins (Terres Univia, 2017). The remaining production is due to France and Mediterranean countries such as Italia, Spain, Greece and Egypt. This latter production is about 25,000 tons and is likely to be mainly white lupin (FAO, 2017). Narrow-leaf lupin seed yields are very variable, ranging from 1.3-4.5 t/ha in France, 1.6-2.3 t/ha in Serbia, to 1.6 t/ha in Australia (FAO, 2017; Boisnard, 2013; GAB/FRAB, 2013; Mihailovic et al., 2008). Lupinus angustifolius is grown as a winter annual in Mediterranean environments or as a summer annual in temperate regions (Ecocrop, 2017). In dry areas and sandy soils of Australia, it is recommended to sow narrow-leaf lupin during a one-month period in autumn (from mid-April to mid-May) and somewhat later on loamy soils (end of May) for harvest in late spring (October-November). Blue lupin seeds intended for sowing should be tested for anthracnose infection and inoculated with adequate rhizobium (Rhizobium lupini) if the crop has not been cultivated previously in the stand (Métivier et al., 2013; Jansen, 2006). Seedbed should be weeded prior to sowing operations (Arvalis, 2014; PGRO, 2014) and multiple weeding operations might be required during blue lupin growth (GAB/FRAB, 2013). In Australia, minimum or zero-tillage is recommended before narrow-leaf lupin cultivation as cereal stubbles provide protection for the seedling lupin plants. This is important on sandy soils where wind erosion may be a problem and the lupin plant may suffer from wind blasting (PWA, 2017). Stubble also helps to reduce splash of brown spot spores. In France, sowing blue lupin in association with barley was recommended to limit weed development, in organic production (GAB/FRAB, 2013). Sowing rates are variable, depending on climatic conditions, soils, and habit types: in the UK, branchy narrow-leaf types should be sown at approximately 70-80 seeds/m², and non-branchy narrow-leaf types should be sown at about 90-110 seeds/m². Increasing seed rates of narrow-leaf lupin up to 125-150 seeds/m² could increase yield potential and improve row width and population (PGRO, 2014). Blue lupins are susceptible to anthracnose (Colletotrichum gloeosporioides or C. acutatum), a common seed-borne disease in countries with humid summers. They are less susceptible than white lupin to this disease, which can be be controlled through fungicide treatments (PGRO, 2014). Harvest should begin once seed moisture content is 14% and when air moisture is high, to prevent pod drops or seeds shattering (during early morning or at night) and to maximise grain quality (OGTR, 2013). Windrowing has been reported to be an effective way of harvesting (OGTR, 2013). Windrowing should be done when seeds of the whole plant contain about 40% DM, which is achieved when the lower pods have turned yellow with cotyledons of their seeds turning yellow-green, while the pods of the upper stage are still green and cotyledons of their seeds still bright green (Carpenter, 2000). Once harvested, lupin seeds can be stored either dried or ensiled. Another way to preserve lupin is to crimp the seeds and ensile them on the day of harvest (Strzelecki, 2015). This process allows early harvest (at high moisture content) and provides good preservation of homegrown seeds (Kemira, 2010). Crimping is adapted to the production of home-grown feed (Strzelecki, 2015; Kemira, 2010). Romans used to grow lupins as a green manuring crop for improving soils (Burtt, 1981). Lupins are N-fixing legumes that are reported to fix 300-400 kg N/ha, in Europe and Australia (Jansen, 2006). Lupins can provide benefit to the following crop (PGRO, 2014). Lupins are valuable legumes for sustainable P management. In soils depleted in available P, lupin plants form specialized cluster root structures and/or release P-mobilizing carboxylates that free it from insoluble forms (Lambers et al., 2012). Thanks to its deep taproot, the lupin plant improves soil texture and drainage. Lupins can be used after a summer metal-accumulating plant used for phytoremediation. Lupins may extend the phytoremediation period and increase the bioavailability of metals in polluted soils under recovery (Fumagalli et al., 2014). Blue lupin seed is rich in protein (27-44% DM) and richer in fat (about 4-8% DM) than pea and faba bean. It is poorer in protein than white lupin and yellow lupin. Its fat content is similar to that of yellow lupin but lower than that of white lupin. Lupins have unique carbohydrate properties characterized by small levels of starch (though the polarimetric method for starch analysis may erroneously report starch levels up to 10%), high levels of soluble and insoluble NSP, and high levels of raffinose oligosaccharides, all of which can affect the utilization of energy and the digestion of other nutrients in the diet (van Barneveld, 1999). Seed yield is not negatively correlated with protein content as it is the case in other lupin species (Berk et al., 2008). The bitter earlier varieties of lupins contained a toxic alkaloid and were not recommended for animal feeding unless the alkaloid was removed by soaking in water. The newly obtained sweet alkaloid-free varieties, which can be distinguished by taste and smaller growth, are palatable to stock. The seeds of modern cultivars of narrow-leaf lupin normally contain less than 0.03% alkaloids (Petterson et al., 1987). 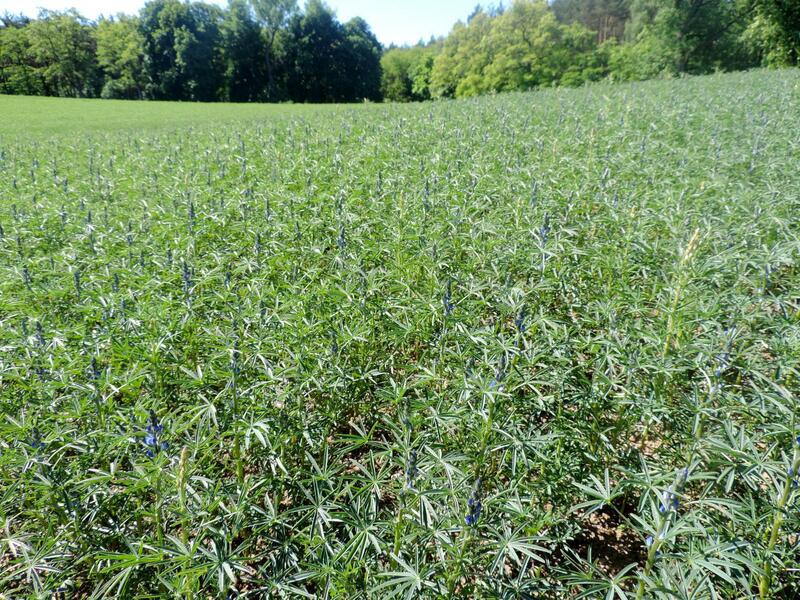 A study assessing 329 accessions of the Polish blue lupin (Lupinus angustifolius) collection of wild types and cultivars reported levels below 0.01% of seed dry weight in cultivars (Kamel et al., 2016). Lupin seeds are known to contain significant levels (from 4 to 20%) of oligosaccharides of the raffinose family that may impair intestinal function and cause flatulence (Pisarikova et al., 2009; Saini, 1989). In blue lupin seeds, alpha-galactoside level was reported to be about 60 g/kg DM or 40.8-73.5 g/kg OM (Roth-Maier et al., 2004; Gdala et al., 1997). Oligosaccharide level is variable and may depend on the variety but also on the conditions of cultivation and harvest (Pisarikova et al., 2009). Lupinus angustifolius is a valuable species for ruminants. In Australia, blue lupin seeds are the main feed for sheep (Nelson et al., 2000). The high protein of blue lupin seeds makes them valuable alternative to soybean meal. Blue lupin seeds are more variable in terms of protein than white and yellow lupins. Blue lupin seeds have, like the other lupins, slightly higher energy than soybean meal in beef and dairy cattle (Berk et al., 2008). Blue lupin seeds can be used whole or ground, raw or roasted (Yu et al., 1999a; Yu et al., 1999b; Yu et al., 2001 ; Niwińska et al., 2011). As for white and yellow lupin seeds, the high rumen degradability of protein and amino acids may result in a low metabolisable protein (MP) value. Only scarce information could be found on the usefulness of roasting or grinding the seeds for better nutritive value. However, it can be inferred that processing could have the same effects as for white lupin seeds. The rumen effective protein degradation coefficient (EPD) of blue lupin seeds assessed in sheep was found to be much higher (0.77) than that of soybean meal (0.65) but lower than that of yellow lupin seeds (0.82) (Niwińska, 2001; Zebrowska et al., 1997). The soluble fraction was much higher (60% vs. 20%) than that of soybean meal, and the degradable fraction was degraded more slowly in blue than in yellow lupin seeds (Niwińska, 2001). When blue lupin seeds were ground, it was shown that coarse grinding 5.7 mm vs. 1.0 mm decreased rumen degradability and increased the amount of protein digested in the small intestine (Niwińska et al., 2011). In lupin, only 3% of N and 2% of essential amino acids were absorbed in the intestine (Zebrowska et al., 1997). Blue lupin seeds have relatively high digestibilities in ruminants. Digestibilities of OM, CP and EE were respectively 79%, 71% and 30% (Roth-Maier et al., 2003). Energy values were 11.9 MJ/kg DM for ME and 7.2 MJ/kg DM for NEL (Net Energy of Lactation), slightly higher than yellow lupin seeds, but much lower than white lupin seeds (-3 MJ for ME and -1.5 MJ for NEL) (Roth-Maier et al., 2003; Roth-Maier et al., 1995). Though only few experiments have been reported on the effect of treatments on the digestibility of blue lupin seeds, it is probable that processing would increase their nutritional value like in other lupin species. Dry roasting of whole white lupin seeds has been reported to significantly reduce the effective degradability of protein while increasing undegraded feed protein and starch and increasing the estimated intestinal digestion (Yu et al., 1999a; Yu et al., 1999b). The benefit of dry roasting was confirmed with blue lupin seeds fed in isoenergetic, isonitrogenous diets to 6 month old lambs (35 kg BW). Dry roasting resulted in increased ADG (+9-10 g/d) and increased gain to feed ratio (+8 g/d) in comparison to raw blue lupin seeds (Yu et al., 2001). Condensed grape seed tannins reduced soluble and degradable fractions of blue lupin seeds, improving their protein efficiency (Bruno-Soares et al., 2011). In Australia, blue lupin seeds are commonly used as a protein source in sheep diets. They are often used in control diets in experiments at levels varying from 35% to 70% for comparisons with other grain legumes such as Lathyrus cicera or lablab (Lablab purpureus) (White et al., 2002; Dixon et al., 1998). However, inclusion at 70% resulted in digestive upsets such as mild diarrhea and anorexia (White et al., 2002). In a comparison with cowpea (Vigna unguiculata) and navy beans (Phaseolus vulgaris), lupins seeds were included at 10, 20 and 40 g/kg LW0.75 as a supplement to low quality roughage (50% chopped oaten hay and 50% barley straw) in a sheep (33 kg LW) diet, corresponding to 16, 32 and 59% of total DM intake (Paduano et al., 1995). Lupins resulted in increasing overall dietary intake, increasing liveweight gain, increasing wool growth and improved feed conversion ratio. The digestible OM intake was increased substantially with each increase in level of lupin supplement. The rapid disappearance of DM from lupin has suggested that lupins could mainly provide substrate for fermentation while bringing only a low proportion of rumen undegradable protein for digestion in the small intestine. This is consistent with results obtained by other authors with white lupins (Benchaar et al., 1994; Kibelolaud et al., 1993; Cros et al., 1992). Animals fed on lupins had higher growth performance than those fed no supplement but, contrary to what had been observed previously, lupins did not yield better results than the other grain legumes (Paduano et al., 1995; Holmes et al., 1991). In Ethiopia, sweet blue lupin seeds could potentially replace commercial concentrate supplement feed to a crop residue based diet. The relatively high protein content and low alkaloid content of blue lupin seeds combined with a good palatability to sheep suggested that lupin seeds could be used to replace other protein sources. Increasing levels of blue lupin seeds had no effect on DM, protein, ash and OM intake but resulted in a decreasing trend for body weight gain (Yeheyis et al., 2012). Washera lambs (17 kg BW) fed on natural pasture hay could be supplemented with increasing levels of blue lupin seeds during 90 days. Diets were designed in order to provide increasing levels of crude protein i.e. 110 g, 127 g and 144 g/d, with the intermediary level corresponding to NRC requirements for lambs (10 kg BW) (Nahom Ephrem et al., 2015). Increasing levels of blue lupin seeds increased the intake and digestibility of DM, protein and OM, as well as average daily gain. Optimal level was found to be the intermediary level providing 127 g/d crude protein with 150 g wheat bran and 245 g blue lupin seeds, corresponding to about 30% (DM basis) of blue lupin seeds in the diet (Nahom Ephrem et al., 2015). In Poland, blue lupin cultivars with different alkaloid contents, sweet (0.10-0.12% alkaloids), semi-bitter (0.3%) and bitter (1.98%), were used to replace soybean meal in isonitrogenous diets (15% protein). 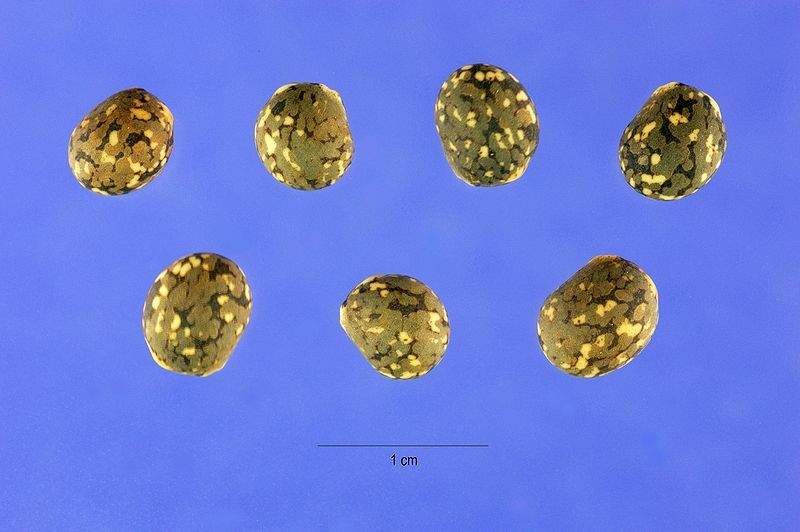 Sweet and semi-bitter blue lupin seeds could replace soybean meal and yielded 180-188 g/d average daily gain, except for the seeds from the bitter cultivar which yielded significantly less gain (175 g/d) (Urbaniak, 1995). Other parameters such as carcass yield, dressing percentage, lean yield, bone and fat, wool production and wool sulphur content were similar in all diets (Urbaniak, 1999a; Urbaniak, 1999b; Urbaniak, 1995). Weaning calves were given increasing levels (0, 33, 67 and 100%) of steam-rolled blue lupin seeds as a complement of the concentrate and of a milk substitute during 15 weeks after weaning. Calves on 100% blue lupin seeds ate less, grew less rapidly and suffered anorexia from week 5 to 7. Blue lupin seeds were then abandoned. It was concluded that calves could be fed up to 67% blue lupin steam-rolled seeds without negative effect on rumen development or blood parameters (Hoang et al., 1995). In Chili, it was possible to finish heifers with a mixture of 60% barley whole crop silage and 40% concentrate made out of 38% blue lupine seeds (entire or ground) and 62% oat grain. Blue lupin seeds represented about 15% of the diet (Rojas et al., 2011). Grinding had no significant effect on daily intake or growth performance. The optimal cost was obtained with barley silage and whole grain of both oats and lupin (Rojas et al., 2011). In Belarus, blue lupin seed meal could be fed to 6-9 months heifers and had positive effects on digestibilities of DM, OM, protein and crude fibre compared to control (Kapustin et al., 1997). When fed to heifers of different classes of age (from 6 to 18 months), lupin seed meal resulted in all cases in higher average daily gains (Goryachev et al., 1997). In Chile, finishing Hereford steers (9-10 month-old) had higher DM intake with blue lupin seeds in the diet than with white lupin seeds (6.23 kg vs. 5.74 kg DM overall dietary intake). The amount of blue lupin seeds was also relatively higher (25% DM intake vs. 22% for white lupin seeds) (Rojas et al., 1998). Finishing Hereford steers fed in similar conditions on ground or whole blue lupin seeds in a comparison with white lupin seeds showed no different performance when they were fed ground or whole seeds (Rojas et al., 1999). In Russia, Russian Black Pied bullocks were fed during 10 months on blue lupin seed meal at levels increasing with bullock age, from 6.5 to 20%. The use of blue lupin seeds resulted in improved growth, development and reproductive function when compared to pea seed meal diet (Vashchekin et al., 2005). In Australia, the use of blue lupin seed meal was assessed in a comparison with common vetch seed meal for high-yielding dairy cows in early lactation. The diet was based on a silage of wilted perennial ryegrass (Lolium perenne) and subterranean clover (Trifolium subterraneum) offered ad libitum, supplemented with 8 kg (fresh weight) of a mixture (50:50) of rolled-barley grain and a grain legume (lupin or vetch) and 1 kg concentrate including minerals. Lupin seed meal resulted in lower body weight gain (0.2 kg less than common vetch) but yielded more milk, milk fat and milk protein than common vetch seed meal (Valentine et al., 1996). This positive effect was confirmed later in Belarus where high-yielding cows receiving lupin seeds representing 4-10% of the nutritive value of the ration had higher milk productivity (+4.5-6.1%) and improved health (Goryachev et al., 2001). A study assessing the nutritive value of organically grown blue lupin in Denmark showed that high yielding cows could be fed on a grass-clover silage supplemented with a concentrate mixture containing barley grain and blue lupin seeds, either raw or heat treated, in roughly equal proportion. The study showed that the mixture containing untreated blue lupin seeds yielded similar results than cereals used in the control diet, while heat-treated lupin seeds tended to yield more milk (Mogensen et al., 2008). Blue lupin seeds are readily eaten by pigs and may represent a valuable protein source in pig diets. However, they have a low and variable lysine availability (37-65%) (Noblet et al., 1998; Gdala et al., 1996). Blue lupin seeds have good digestibility coefficients of energy in growing pigs and sows, at 77 and 85% for whole seeds, and 81 and 89% for seed kernels, resulting in high digestible energy for growing pigs with 15.7 and 16.8 MJ/kg DM for whole seeds and seed kernels, respectively. For sows it was reported to be higher at 17.3 and 18.6 MJ/kg DM, respectively. These results were confirmed in growing pigs with values of digestible energy contents for blue lupin seeds and kernels of 15.8 and 16.85 MJ/kg DM (King et al., 2000). Weaner piglets (6 kg) were offered lupin kernels at up to 24% of the diet in order to replace milky ingredients in a wheat-based diet. Over 18% lupin seed or lupin kernel inclusion, piglets had lower growth, higher faecal hemolytic E. coli and increased plasma urea nitrogen. They had lower total tract digestibility of DM compared to the piglets fed the control diet (Kim et al., 2012). In young pigs (9 kg), raw blue lupin seeds replacing 50 or 75% soybean meal did not affect animal performance and did not change the microbial status of ileal digesta (Zaworska et al., 2017; Kasprowicz-Potocka et al., 2013). Larger growing pigs and fattening pigs (from 20 to 105 kg) could be fed on raw blue lupin seeds that totally replaced soybean meal without altering growth performance (Kasprowicz-Potocka et al., 2016). Inclusion levels of blue lupin seeds in growing and fattening pigs may be variable, ranging from 10 to 41% with variable effects on growing pigs performance and feed efficiency, as reported below. High levels of inclusion were not a problem in fattening animals. Lupin seeds with or without enzyme supplementation were fed at up to 35% of the diet to growing and fattening pigs. The inclusion of lupin seeds had no effect on animal growth performance and did not affect carcass composition or meat quality. Enzyme supplementation was not necessary as it did not improve overall performance or quality (Kim et al., 2011). In an experiment where growing pigs (male and female, 24 kg) were fed on 10% blue lupin kernel (dehulled seeds) of cultivar Sonet, it was shown that animals had slightly lower growth performance (not significant) that could be explained by lower essential amino acids (methionine, lysine and threonine) content of lupin. Animal health status was unaltered by lupin inclusion. Dressing percentage and lean yields were not affected, and the meat quality parameters of pigs fed on lupins were reported to be more tender and palatable (Zralý et al., 2006). In a slightly earlier experience where growing and fattening pigs received 20% blue lupin (with or without enzymes) in order to replace soybean meal, it was reported that feeding blue lupin resulted in significantly higher growth performance in growing pigs wether the diet was enzyme supplemented or not. For fattening pigs, growth performances were similar to those of pigs fed the control diet, and enzyme supplemented diets had better feed efficiency (2.83 vs. 2.91 kg feed per kg gain) ( Roth-Maier et al., 2004). Body weight gains of fatteners fed with blue lupin completely replacing soybean meal were comparable to controls (Hanczakowska et al., 2014). No growth depression was observed in pigs fed diet with blue lupin at high dietary inclusion (41%) compared to the diet based on barley and soybean (Gdala et al., 1996). There are contradictory results about the usefulness of germinating blue lupin seeds before feeding them to pigs. Lupin seed fermentation has an effect on the apparent ileal digestibility of protein and several amino acids (methionine, cysteine, isoleucine, leucine, phenylalanine and valine) (Zaworska et al., 2017). However, the same authors had previously reported no positive effect of fermentation on standardized ileal digestibility (SID) of protein and amino acids, and lower SID for lysine and methionine (Chilomer et al., 2013). Germination was reported to reduce the antinutritional factors (alkaloids and raffinose) of the seeds (Chilomer et al., 2013). When offered to pigs, fermented lupin seeds did not affect the microbial status of the ileal digesta (Zaworska et al., 2017). Germinated blue lupin seeds fed to young pigs (9 kg) did not affect performance even at high levels of inclusion (50 or 75% of soybean level). At the highest level (75%), germinated blue lupin seeds worsened pig feed efficiency (Kasprowicz-Potocka et al., 2013). Nutritional value and suitability of lupins for poultry feeding vary greatly according to variety (sweet or bitter, yellow, blue or white), composition, treatments, etc. (Jeroch et al., 2016). Protein, amino acid and fatty acid contents of lupins suggest they are valuable raw materials for poultry feeding. However, they are poorly used since they are poorly available for feed manufacturers or poultry producers. The interest of lupins for poultry feeding must be discussed according to their ME value, aminoacid digestibility and anti-nutritional factor content (alkaloids, oligosaccharides, etc.). According to the variety and the cultivar, their ME value can be higher than 10MJ/kg DM, but values as low as 8.3MJ/kg DM were observed for seeds whose oligosaccharide content (mainly raffinose) was high (Kaczmarek et al., 2016). The mean protein content is close to 40% DM, but large variations are observed. The protein content of white lupin (Lupinus albus) varieties is lower than those observed in yellow lupin (Lupinus luteus) (Sujak et al., 2006). Aminoacid profile varies also according to the family or cultivar. White and blue lupins have a lower protein variablity than yellow lupins (39-44.4% DM) (Kaczmarek et al., 2016). In order to improve the nutritional value of lupins, seeds can be dehulled before feeding birds. After dehulling the non starch polysaccharide (NSP) content is reduced, the ME value is improved, and in some cases the amino acid digestibility is also improved (Brenes et al., 1993; Nalle et al., 2010). Some attempts have also been made for reducing the effect of anti-nutritional factors. Alkaloid content is reduced in sweet lupin, which contains only trace of those compounds. Currently, oligosaccharides are the main problem which limits the use of lupin in poultry diets when the diets are well balanced for energy, amino acids (methionine supply) and minerals, and when sweet varieties are used. High levels of oligosaccharides (alpha-galactosides) are known to produce negative effects on digestive processes (increased digesta viscosity, reduced digestibility, sticky droppings), and consequently reduce performances. On the opposite, small amounts of lupins are mentioned to affect favourably fermentation processes and stimulate gut microbiota in turkey (Zduńczyk et al., 2014). With high amounts of dietary lupins (30%), ME value and amino acid digestibility are negatively correlated with raffinose and water extract viscosity (Kaczmarek et al., 2016). Alpha-galactosides are not digested in the upper part of the gastro-intestinal tract of the birds, being only fermented in the caeca and producing short-chain fatty acids, poorly used in poultry. Attempts have been made to reduce these negative effects by adding exogenous carbohydrases. Some improvements were observed in diets containing large amounts (50 and 70%) of raw lupins (Brenes et al., 1993). Sweet blue lupin seeds could be included at up to 20% of the diet in broilers (Roth-Maier et al., 2003; Nalle et al., 2011). Inclusion of blue lupin seeds at 15% of the diet for laying hens resulted in no adverse effects in production or hen health and could be used as part of a balanced ration with inclusion of NSP degrading enzymes to reduce reliance on soybean protein (Lee et al., 2016). Laying hens fed diets containing 10 or 20% of blue lupin presented the same performances as those fed the control diet, moreover egg quality was improved (Drazbo et al., 2014). No information on the utilization of blue lupin seeds in rabbit feeding seems available in the international literature (February 2017). When included in balanced diets, whole or dehulled sweet lupin seeds allow growth performance similar to soybean meal in growing pigs (Batterham, 1979; King et al., 2000) and poultry (Rubio et al., 2003; Nalle et al., 2011), so blue lupin seeds may be considered as a potential raw material for rabbit feeding. The digestible energy content can be estimated at 13.7 MJ/kg DM (Lebas, 2016). In the early 2000s, with the increasing development of aquaculture and the scarcity of fishmeal, the nutritive value of several plant protein sources have been assessed. Lupins, and particularly blue lupins, have been shown to have huge potential as fish meal replacer, as they compare favourably with soybean meal. Dehulling is often recommended, as well as drying treatments or treatments aiming at reducing alkaloid or non starch polysaccharides (NSP) content. Blue lupin seeds have a high protein content, which has an important impact on energy digestibility in fish (Glencross et al., 2003a). Dehulling blue lupin seeds had a beneficial effect on most digestibility parameters in rainbow trouts (Glencross et al., 2007a). Drying affects the ability of fish to utilize digestible protein and energy of the feed: spray-dried lupin seeds provided better results than heat-dried seeds (Glencross et al., 2007b). The use of galactosidase or ethanol to extract oligosaccharides from lupin seeds had beneficial nutritional implications for rainbow trouts (Glencross et al., 2003c). Most of the feeding trials refer to dehulled blue lupins (kernel meal). Rainbow trouts fed on isonitrogenous diets were offered blue lupin kernel meal at 15 or 30% of the diet. While digestible protein remained unchanged among all diets, digestible energy and digestible phosphorus significantly increased in the lupin-based diets. It was concluded that blue lupin kernel meal could be included at up to 30% of the diet without affecting the ability of rainbow trout to utilize the dietary digestible protein and energy of the diet (Glencross et al., 2008). Including blue lupin kernels at levels varying from 10 to 50% during 8 weeks in rainbow trout diets resulted in a non significant decrease of growth performance as lupin level increased. Energy utilization and feed efficiency decreased at higher levels of inclusion and it was recommended to include up to 40% blue lupin kernel so that growth performance and nutrient utilization are not altered (Farhangi et al., 2001). Blue lupin kernel meal fed to post-smolt Atlantic salmon (90 g) at 30% dietary level had significant effect on fish specific growth, and it improved the apparent digestibility of the diet with notable effects on the organic matter, nitrogen, energy, arginine and lysine digestibilities (Salini et al., 2014). Atlantic salmon could more fully digest the energy content of protein-rich ingredients, especially since NSP are reduced in ingredients such as lupins (Glencross et al., 2004b). Whole seeds and kernel meal of blue lupin have been fed to silver perch (Bidyanus bidyanus) and dehulling had positive effect on lupin nutritive parameters such as DM, N and energy digestibilities (PWA, 2017). Blue lupin seeds and blue lupin concentrates were included in the diet of juvenile barramundi (4.3 g) in order to replace 45% of the protein provided by fishmeal in the control diet. Specific fish growth, protein feed efficiency and energy efficiency did not differ from the control. No protein metabolism issues was reported and it was concluded that lupin seeds could replace fishmeal in juvenile barramundi diets (Katersky et al., 2009). However, it was shown that nutritive values (digestible protein and digestible energy) of blue lupin seeds cv. Myallie were lower than that of white lupin seeds in barramundi (Tabrett et al., 2012). Fermenting blue lupin seeds with Lactobacilli could increase the inclusion level at up to 60% replacement of fish meal in juvenile barramundi diets, without affecting survival rates. Increasing the level of fermented lupin seeds enhanced growth performance and had no deleterious effect on fish carcass protein, fat and energy content (Binh Van Vo et al., 2015). Raw or dehulled lupin seeds could partially (33 or 67%) replace protein from soybean meal in juvenile Nile Tilapia diets. At 100% replacement, growth and feed peformance were lower. Reducing alkaloids in seeds improved feed performance, and dehulling had a positive effect on both fish and feed performance (Chien et al., 2003). In a trial assessing different species of lupins (white, yellow and blue), blue lupin kernels were included at 30% of red seabream diets, replacing soybean meal. Protein digestibility of blue lupin kernel was higher than for soybean meal but energy digestiblity was ranging between 61% and 70% which was lower than for soybean meal (81%). Blue lupin kernel had a lower nutritive value than other lupin kernels but all three species showed good potential for red seabream feeding (Glencross et al., 2004a). Blue lupin seed meal, either raw or micronized, was fed at increasing dietary levels to juvenile gilthead seabream during 12 weeks, in order to replace fishmeal protein (10, 20, and 30%). Fish growths of both experimental groups were identical and higher than those of the control group. There were no differences in feed intake and feed utilization. 20% micronized blue lupin seed meal resulted in significantly higher fish performance than the control. It was concluded that raw and micronized lupin seed meal could replace up to 30% protein from soybean meal but micronized lupins provided higher growth rates (Pereira et al., 2004). In a trial comparing different species of lupin for shrimp (Penaeus monodon) feeding, blue lupin seed meal was better utilized by juvenile shrimps than white lupin seed meal and that the nutritive value of blue lupin diet was equal to that of soybean (control) diet. The blue lupin seed meal diet was more attractive to juvenile shrims than the white lupin diet (Sudaryono et al., 1999). The inclusion of blue lupin seed meal or soybean meal in black tiger shrimp diet, contributing 41.5% of the protein of the diet, was compared to fishmeal during 50 days. Both plant diets were equal or compared favourably to fishmeal diet for growth performance and survival rates and FCR had only little difference. It was concluded that new cultivars of blue lupin could be used to feed juvenile shrimps and further assessment of amino acid requirements of shrimp were recommended so that lupin seeds are not erroneously discarded from the diet because of low methionine content (Smith et al., 2007b). Apparent digestibilities of DM, protein, energy, and amino acids of blue lupin seeds in black tiger shrimps production have been determined. They were respectively in the range of 57-66% for DM, between 93 and 97% for protein and amino acids, and between 69-77% for energy. It was concluded that apparent digestibility values could be safely used to formulate shrimp feeds (Smith et al., 2007a). Apparent digestibilities of protein, amino acids, and gross energy from whole and dehulled blue lupins were assessed in green lip abalone (Haliotis laevigata). For crude protein, apparent digestibilities were high with 91% for whole lupin seeds and 92% for lupin kernels, which was similar to those of soybean meal. In comparison, energy digestibility was more variable and lower than that of soy flour (87%) at respectively 83% for dehulled seeds and only 50% for whole blue lupin seeds. In the latter case, it was assumed that abalones were not able to digest the fibre contained in lupin seed hulls (Vandepeer et al., 2002). Black lip abalone (Haliotis rubra) benefited better from protein and cellulose of blue lupin seeds than green lip abalone (Haliotis laevigata). Green lip abalone digested their NSP more extensively than black lip abalone (Vandepeer et al., 2003). Curnow, M., 2019. Grazing stubble and dry pasture. Gov. West. Aust., Dep. Prim. Ind. Reg. Dev. Wilkinson, I., 2017. Western Australian lupin industry. Gov. West. Aust., Dep. Prim. Ind. Reg. Dev.